Here is one of the greatest starter kits available: KR808D-1. This is a cartomizer kit that will allow you to vape practically all day long. In this particular kit, you get two rechargeable batteries. One of the batteries is our standard 3.7v 180mAh capacity and the second battery is our mega battery with 3.7v 280mAh capacity. 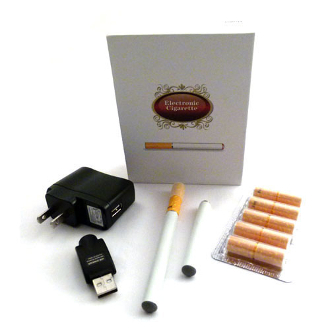 Along with the two different size batteries, there is one USB charger, one wall adaptor with USB port, and 6 cartomizers with varying levels of nicotine from no nicotine to high nicotine. The cartomizers in the kit are all tobacco flavor. All of the cartomizers are refillable with our e-liquid juice. This kit currently is available in three color options: black, white, and silver. For charging batteries on-the-go, please take a look at the available PCC for the KR808-D1. Note: When you first receive this kit, brand new batteries must be charged for a full 8 hours! After the initial charge of 8 hours, anytime the batteries need to be recharged, charge time is for only 2-3 hours.